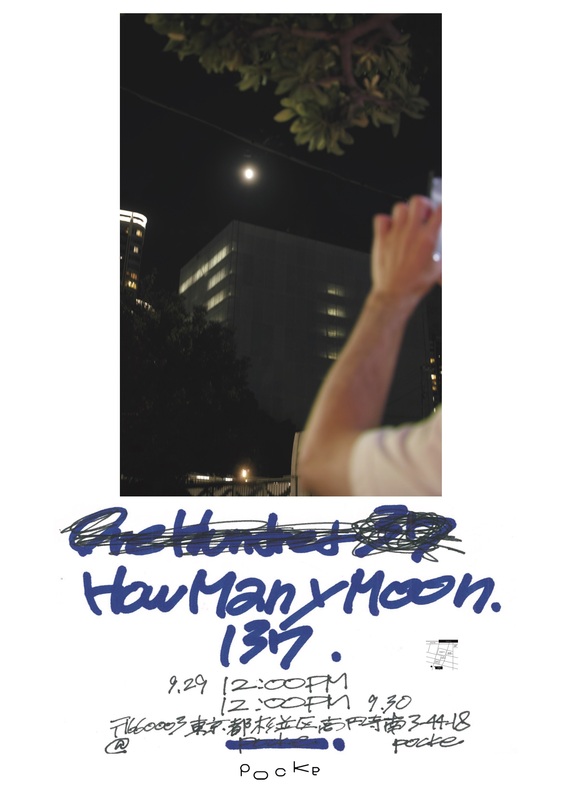 How Many Moon. One Hundred Thirty Seven. open 9/29 12:00 p.m. ~ 9/30 12:00 p.m.
City is the place where is filled with uncountable objects. Without objects the light would just travel through. Every objects bend the light in its own way, at its site. That is the perspectives, that is the shapes, in another words, the colors. We keep on looking at horizons where the light gets condensed most and start hiding from us, we are on the edge or with the edge. That is the details and it’s incomprehensive because so much information is rushing to there, simply, it shines so blight. (The edge is the best part of a donut!) City is keeping on changing and generating new structure without knowing who did it and how it was done. Structure generates color, or the color is the structure. It’s like a butterfly and who cares whether it’s my dream or butterfly’s? (Come on all you ghosts.) Let our city dreams colorfully yet calmly.